Tropical Storm Debby is now a memory after hanging around SW Florida for way too long. Our local waters were a churned up mess for a solid week and I really thought it would take a long time to recover. Fortunately that wasn't the case and the winds and seas calmed down almost overnight. Since Friday we've been smashing the redfish for the last three days. My first charter after a week of cancellations was with one of my favorite local anglers Herchel Avra and his son-in-law BJ, pictured above with a 30 inch redfish he caught just south of Matlacha. This oversized fish ate a white Gulp Shrimp right at the height of the rising tide. We released this one safely and went on to land a handful of other species as well as casting to dozens of rolling tarpon with a fly rod. 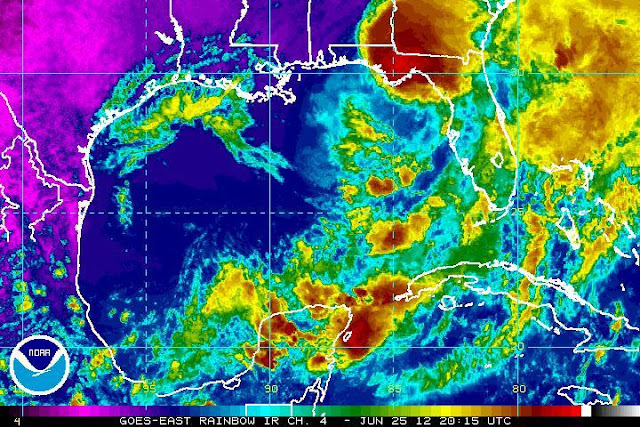 It's great to have our summer weather back so quickly after our first tropical disturbance is several years. The Florida Fish and Wildlife Conservation Commission (FWC) voted to keep the recreational harvest of snook in Gulf of Mexico waters closed for another year to offer the species additional protection after a 2010 cold kill detrimentally affected the population. The decision came at the June 28 Commission meeting in Palm Beach Gardens after staff presented an updated stock assessment that showed snook populations are improving in the Atlantic and are not in biological jeopardy in the Gulf. The next assessment is due in 2015. The recreational snook season was closed in Gulf of Mexico and Atlantic waters by executive order on Jan.16, 2010, after the cold kill. The FWC manages snook in both state and federal waters, though the species tends to inhabit the shallower, near-shore state waters. The effects of the cold kill were less severe on the Atlantic coast, where the normal season reopened for harvest Sept. 1, 2011. The Gulf of Mexico recreational season was to reopen Sept. 1, 2012, and now is expected to reopen Sept. 1, 2013. Catch-and-release of snook will be allowed during the closure. In the Atlantic, the season will remain unchanged. Annual closures in the Atlantic are from Dec. 15 through Jan. 31 and from June 1 through Aug. 31. There is no commercial harvest for snook in Florida. Snook are one of Florida’s premier game fish, and anglers often practice catch-and-release techniques when targeting this species. When planning to release snook, proper handling techniques ensure the best chance of survival. This includes returning the fish to the water as quickly as possible; using wet hands to handle the fish; supporting its weight in a horizontal position when the fish is out of the water; not holding the fish by the gill plate, eye or jaw; and reviving the fish if necessary by running it through the water head-first to allow water to flow over its gills. Some good news for west coast anglers was just issued from the FWC. After a closure of more than two years after the destructive freeze of January, 2010, snook season will be reopened in a few months on this side of the state. This is a controversial decision with a lot of anglers but I agree with the FWC on this one. I've seen a lot of really decent snook this year and the slot size is so narrow that it's tricky to get a legal one. These fish are doing just fine and it's time to let us keep one once again. Download and read the whole FWC report here. Well that was an unwelcome mess. The first tropical storm to hit this area in years came right at the height of our tarpon season and stayed for way too long. Fortunately, Debby has finally moved on and left no real damage to our area, unlike the Panhandle. Life will get back to normal very quickly on the water and for everyone who's trips I canceled last week, we'll get them next year. My buddy Don Moorehead of Keystone Custom Rods here in Cape Coral just built this beautiful 7' spinning rod for my dad's upcoming 70th birthday. Don used a Rainshadow RX8 blank which is perfectly suited for very light braid. He also added titanium reflex guides and several custom wraps and inlays that you can see in the above photos. I spent some time casting this rod today with a Shimano Saros 3000 reel spooled with 10# Power Pro. I was tossing a Zara Spook at the neighbor's docks in some nasty tropical storm winds and it felt like I had a sniper rifle in my hands. The accuracy of this thing is stunning and it looks like a million bucks. If you want Don to build you one give him a call at 239-292-5201 or check out his website here. My buddy Jason is selling his fully loaded East Cape Lostman skiff. 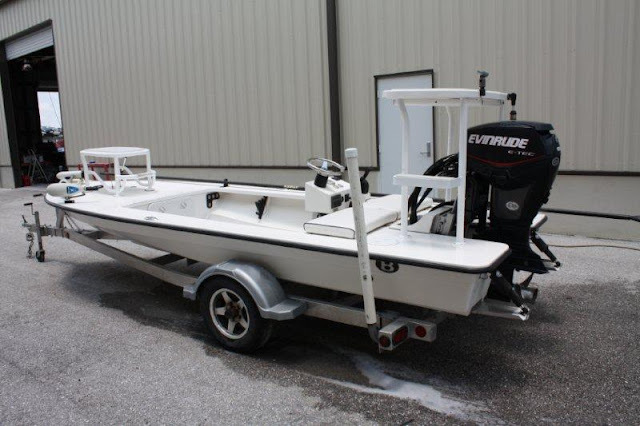 This boat is in showroom new condition with only 70 hours on its Etec 60 outboard. You can check out more photos of the options here. 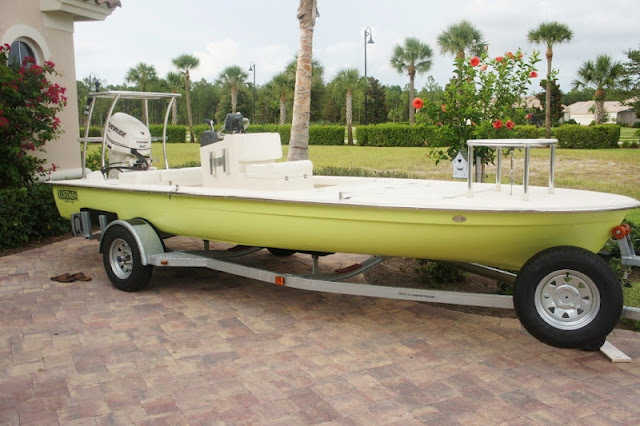 The boat is located in in Ft. Myers and he's asking $28,000. That's several thousand dollars off the price of a 2012 model and without the five to six month wait for delivery from the factory. I've fished on this boat and it's one of the shallowest poling skiffs on the market, a really excellent fly fishing platform. Call Jason at 239-209-6784 to have a look. Update: This boat is SOLD! Bonefish On The Brain is a great fly fishing blog by a guy named Bjorn that I read quite often and so should you. It obviously focuses on chasing the Grey Ghost but every once in a while the publisher tips his hat to the Silver King. Bonefish Bjorn's latest post captures the essense of tarpon fishing in five short but very sweet paragraphs that you can read here. This excellent first genereation Beavertail is one of the best technical poling skiffs ever built. 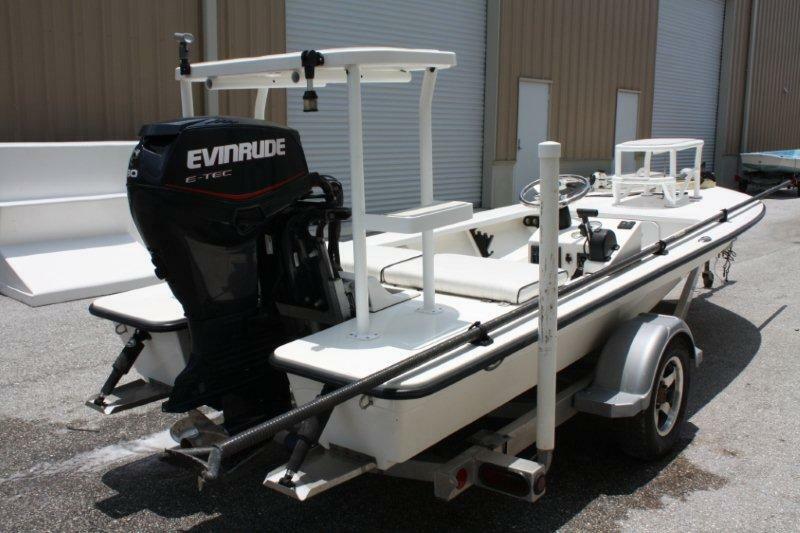 This Evinrude powered B2 has exceptionally low hours and is in excellent condition. It has a 6 inch draft and a 30-plus mph top speed. The boat is currently at the Aeon/Beavertail factory in Palmetto, FL and can be seen on any weekday. Call Liz at 941-705-2090 to arrange a sea trial. Update: The boat has sold but keep checking back if you're interested in one of these skiffs. Another one should be coming on the market soon. Yes, those are a dozen huge tarpon in the photo above all about to swim right under my boat. We were in eight feet of water about a quarter mile off Cayo Costa beach and this was one of at least thirty different schools of fish we cast to on Wednesday afternoon. The conditions were flawless, no wind and a cloudless blue sky, and the tarpon wouldn't eat. What can I say? Tarpon are so damn goofy sometimes in the afternoons. We also watched at least a dozen of these schools form up into spawning daisy chains and got so close that I could have done a cannonball right into the middle of them. The biggest problem fly anglers have is that when sight casting conditions are best, eating is not at the top of the tarpon's list of priorities. They're looking for love, not food in the middle of the day, and that makes getting one to open its mouth so insanely frustrating. The good news is that we're just in the middle of the season for these fish and the big schools will keep running up the Gulf beaches for another month. Stay after them and you'll get your shots. This is Stu Apte's personally designed skiff and rigged with every option available. It was built in March of this year and has less than 20 hours on its 90hp outboard. Best of all, if you purchase this Beavertail Stu will personally go fishing with you on it in his home waters off Islamorada. That alone is worth the asking price of $44,000. To see the full details and a lot more photos click here. My buddy Lou from Cape Coral and his friends charter me once a month so they can bring home a pile of fish for the grill. Today they went home hungry. We caught dozens of trout but only one was slot sized. We also found a school of tailing redfish in the north part of Matlacha Pass and when Lou tossed his Gulp into them this big snook hit instead. This was the first time I've ever seen anyone unhappy with catching a snook. Lou really had his heart set on some redfish fillets and this beautiful linesider screwed that up big time. The snook bite has been excellent lately in Matlacha Pass. My anglers have landed them almost every day even though we've been primarily chasing tarpon with artificials. Head out there with bait well full of greenbacks and you should have no problem slaying them. His stripped down rig is going to be perfect for the flats off Matlacha and Pine Island. Tons of free deck space and a big removable bait well will make this a great snook and redfish boat. With its Yamaha F90 this boat will top out in the mid 40mph range. Yes, it does look a little naked without a poling platform but this isn't a guide's skiff and Claude mostly fishes solo and Beavertail will rig their boats any way the customer wants. In contrast to Claude's bare-bones skiff, here's Stu Apte's latest BT3 which was at the shop for some demo rides and is currently for sale. This boat has every possible option available and will still float in 8 inches of water. I also got to check out this absolute stunner of an Aeon 23 CS that's heading to its new owner's place in the Bahamas. That's a 300hp Yamaha on an Atlas jackplate and huge stern bracket. This boat will easily make the crossing from Miami to Bimini and still and still float in a foot and a half of water. It's new owners could catch blue marlin and bonefish on it in the same afternoon. It's always great to catch up with Will and Liz up at Aeon Marine and see what they're building. I can't give away any details but there are definitely some new projects in the works that should debut later this year. In the meantime, the first annual Aeon/Beavertail owner's tournament it now set for November 10th. Shoot me an e-mail if you'd like some more info. 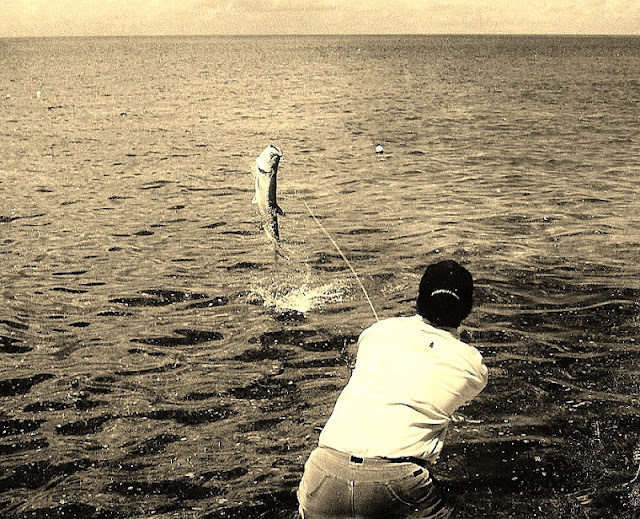 June is here and this is a month that’s usually all about tarpon, tarpon, and more tarpon. It’s true that the silver king holds the top spot with most Pine Island anglers right now but there’s another powerful and acrobatic predator all over the flats this month that’s equally worth pursuing: the black tip shark. I’ve always thought black tips as tarpon with teeth. That’s because they have a tendency to launch themselves into the air as soon as they feel the hook. They can also peel off yard after yard of line in the blink of an eye. The last fish that actually spooled me was a 50 pound black tip that emptied 250 yards of mono while I was trying to pull my anchor in a deep Key West channel. An Olympic sprinter would have been embarrassed by how quickly that shark made off with all of my line. As an added bonus, black tips are one of the few species of shark that will readily attack a fly. An incredible sense of smell but weak eyesight is a characteristic of most sharks. Unfortunately this makes convincing them to eat a scentless hunk of feathers a real trick. Black tips have a powerful nose but they also attack their prey on purely visual cues. Spin fishermen catch them all the time on plugs and lures and a large, flashy fly pattern will usually work just as well. Color, however, is very important when you’re tying shark flies and ironically a very bright, life jacket orange works better than anything else. Twenty pound test fluorocarbon and six inches of light Malin wire is all you’ll need for a bite tippet. While black tips and many other species are common in the shallows right now, getting a good cast at one can be more difficult than most people think. Black tips are especially wary around boats but a good amount of chum in the water can get them into attack mode. For this I really like to use a small jack which I’ll butterfly and hang off the bow. Ladyfish work just as well, too. Then I just drop the Power Pole and wait. If I don’t see a fin within half an hour I’ll start drifting with the current. 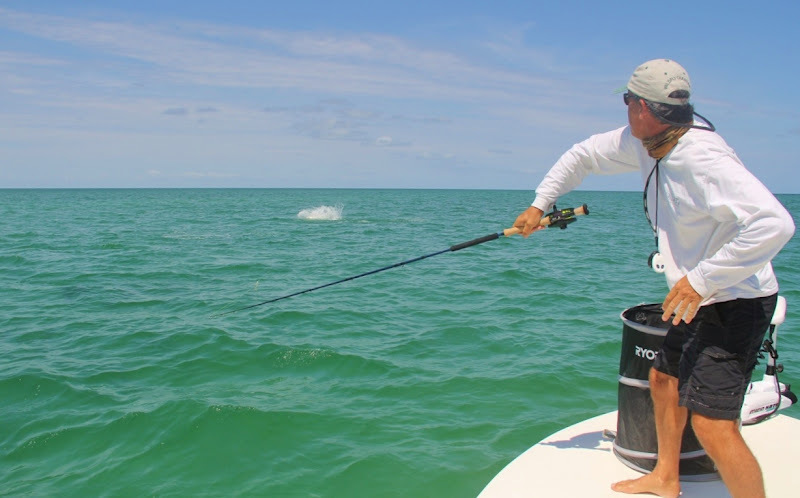 The long sandbars in Charlotte Harbor are a perfect area to set up a chum line for sharks. The water is especially clear up there and you’ll almost always find a decent current. Once a shark is spotted homing in on the scent it’s important to cast well ahead of its path and get the fly moving. Black tips seem especially turned on by motion and will be drawn toward a pulsing orange pattern just under the surface. If they charge the fly it’s important to continue to strip even after the hook disappears under the shark’s nose since their mouth is set further back and the actual take is not always visible. Just like with tarpon, you’ll need to strike them hard with your line hand to make sure the hook penetrates and holds. Any shark’s mouth is as tough as leather and designed to take a lot of punishment when their prey decides to fight back before getting swallowed. Once the fly is stuck keep treating them like tarpon. Get the slack line on the reel quickly and bow to them when the shark jumps. Black tips will test the drag of any reel so let them do their thing for the first few minutes before getting too aggressive. Once they settle down you can pressure them hard and even a full grown black tip can be landed in less than thirty minutes. After you have the shark boat side, be sure to release them unharmed. Some people think black tips are decent eating but I hate seeing them killed for any reason. There are so many better tasting fish out there and almost every shark species has been terribly overfished. Let them all go to fight another day. 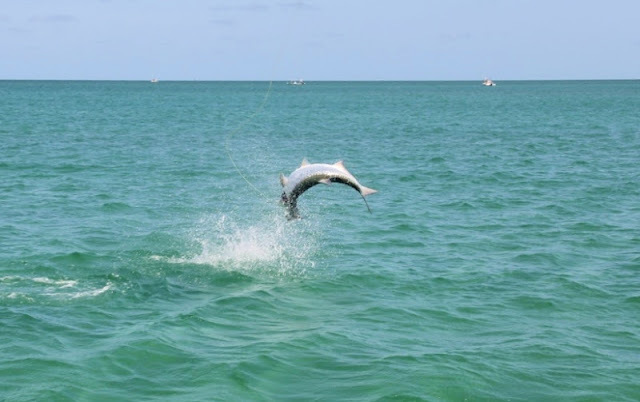 Sharks will never replace tarpon as a glamour species, especially with the fly fishing community, but the beautiful and acrobatic black tips deserve a lot more attention than they get. Virginia Angler EJ Biernesser was casting at some uncooperative tarpon on Saturday morning (are there any other kind on the weekends?) when we spotted a cruising bonnethead shark. A perfect shot with a red and black Tarpon Bunny resulted in an instant take. These sharks are primarily crab eaters with poor eyesight and are difficult to hook on flies. They do put up a great fight, especially on an 8wt. This shark almost removed EJ's nose a split second after this photos was taken. A couple hours later we were banging the shoreline off Pineland when this bruiser red smashed his fly. At 30 inches it was the biggest redfish I've had anyone land on a fly rod so far this year. A real beauty. Since it was 3 inches over the slot it was safely released. The fly was a pink and green Clouser Minnow. You've gotta love any fish that's willing to eat something so unnatural looking. EJ came back on Sunday with his granddaughter Mandy and scored a handful of nice trout on spinning gear in Matlacha Pass. A great weekend on the water for everyone. 2012 has been an absolutely amazing season so far with the new Beavertail. I've run 125 charters and have had to cancel only a small handful of days due to bad weather. The boat continues to perform beyond my expectations and every one of my anglers raves about how dry and comfortable the BT3's ride is. It also drafts shallower than any other 18 foot skiff out there. Here's the proof. Best of all, my Yamaha F70 has performed flawlessly with more than 225 hours on it so far this year. All this engine does is start up and run and I never have to worry for a moment about whether it will get my customers home safely. Confidence in your outboard is priceless when you're a charter guide and Yamahas have given me that as well as great performance and fantastic fuel economy. 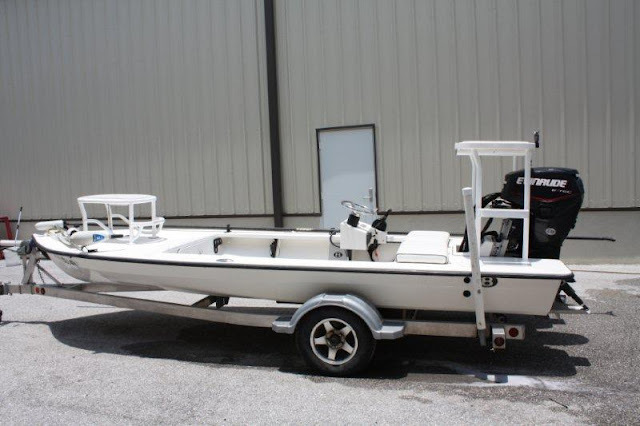 This is my second Beavertail/Yamaha skiff that I've owned. I started using these boats five years ago after a decade of running charters with one of their very well established competitor's hulls and outboards. In the past five years I have never lost a single charter to a maintenance problem. In fact, I have never had a single, unscheduled maintanence issue with either of my Beavertail skiffs or Yamaha outboards. I can't say that about any other mechanical object I've ever owned. Guiding is my only job. Beavertail and Yamaha don't pay me a dime to write these posts. I just like to throw things like this out there, especially when I'm more than thrilled with someone else's product.